URBANA, Ill. – Besides the dandelion, the next biggest lawn challenge can be those annoying annual grasses, says Richard Hentschel, horticulture educator for University of Illinois Extension. As an annual grassy weed, crabgrass seeds germinate in the spring once soil warms and there is adequate soil moisture. Other grassy weeds require the same conditions. “Those other grassy weeds include yellow and green foxtails, goosegrass, and barnyard grass,” Hentschel says. 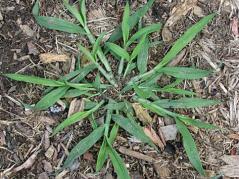 Crabgrass is typically described as a low-growing prostrate grass with a bunch-type root system. Annual foxtails are upright in habit, while barnyard grass and goosegrass are low-growing, just like crabgrass. Crabgrass differs in one big way from the other annual grassy weeds, however. “It will root down along the nodes, making it very difficult to remove by hand if allowed to establish in the lawn,” Hentschel says. Crabgrass management should start in the spring, yet if conditions are right, annual grasses can germinate over a longer period. Grasses, both weedy and desirable types, are monocots. Monocots prefer warmer temperatures, according to Hentschel, which explains why farmers are not out planting field corn (a type of grass) before the soil warms adequately. Application timing for annual grass prevention products will vary throughout the state. Using central Illinois as ground zero, applications are normally applied mid- to late April. Since southern Illinois soils warm up earlier, treatments should be applied one to two weeks earlier and for northern Illinois one to two weeks later. These ranges of applications also depend on the kind of spring we are having, Hentschel says. Crabgrass prevention materials really only need to be applied to those parts of the lawn that have had consistent problems in the past. Annual grasses commonly invade parkways and edges of the sidewalk. Part of the long-term cure is to find out why the annual grasses return each year. Open bare areas or thinned turf will be prime areas for annual grass invasion. Encourage your lawn grasses to fill in with topdressing and seed. Consider raising the mower deck a notch to allow the lawn grasses to be a little taller. “That will shade the soil, helping to keep those annual grassy weed seeds from germinating,” Hentschel says. Once you see that first lighter-green crabgrass seedling in the lawn, it is too late for any pre-emergence products, according to Hentschel. If there are just a few seedlings showing, they pull very easily at that stage. Mature crabgrass plants will create an even bigger area of bare ground as they smother the grasses below.